LA JOLLA—When scientists talk about laboratory stem cells being totipotent or pluripotent, they mean that the cells have the potential, like an embryo, to develop into any type of tissue in the body. What totipotent stem cells can do that pluripotent ones can’t do, however, is develop into tissues that support the embryo, like the placenta. These are called extra-embryonic tissues, and are vital in development and healthy growth. Once a mammalian egg is fertilized and begins dividing, the new cells segregate into two groups: those that will develop into the embryo and those that will develop into supportive tissues like the placenta and amniotic sac. Because this division of labor happens relatively early, researchers often can’t maintain cultured cell lines stably until cells have already passed the point where they could still become either type. 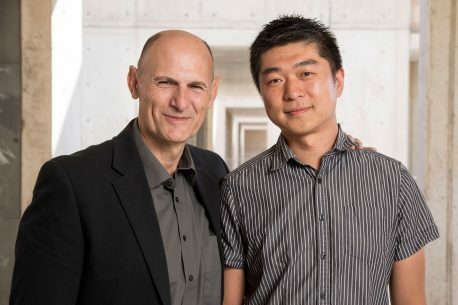 The newly discovered cocktail gives stem cells the ability to stably become either type, leading the Salk team to dub them extended pluripotent stem (EPS) cells. “The superior chimeric competency of both human and mouse EPS cells is advantageous in applications such as the generation of transgenic animal models and the production of replacement organs,” adds Wu. “We are now testing to see whether human EPS cells are more efficient in chimeric contribution to pigs, whose organ size and physiology are closer to humans.” Human EPS cells, combined with the interspecies blastocyst complementation platform as reported by the same Salk team in Cell in January 2017, hold great potential for the generation of human organs in pigs to meet the rising demand for donor organs. “We believe that the derivation of a stable stem cell line with totipotent-like features will have a broad and resounding impact on the stem cell field,” says Izpisua Belmonte. Other authors included: Takayoshi Yamauchi, Atsushi Sugawara and Zhongwei Li of Salk; Yang Yang, Bei Liu, Jun Xu, Jinlin Wang, Cheng Shi, Yaxing Xu, Jiebin Dong, Chengyan Wang, Weifeng Lai, Jialiang Zhu, Liang Xiong, Dicong Zhu, Xiang Li, Chen Li, Aibin He, Yaqin Du, Ting Wang, Chaoran Zhao, Haibo Li, Hongquan Zhang, Xiaochun Chi, and Huan Shen of Peking University; Weifeng Yang and Ming Yin of Beijing Vitalstar Biotechnology; Fangyuan Sun and Xiangyun Li of Hebei University; Yifang Liu of Tsinghua University; Cheng Li of Peking-Tsinghua Center for Life Sciences; Shuguang Duo of the Chinese Academy of Sciences. The work was funded by: the National Key Research and Development Program of China (2016YFA0100100), the National Natural Science Foundation of China (31521004), the Guangdong Innovative and Entrepreneurial Research Team Program (2014ZT05S216), the Science and Technology Planning Project of Guangdong Province, China (2014B020226001), the Science and Technology Program of Guangzhou, China (2016B030232001), the Ministry of Education of China (111 Project), the BeiHao Stem Cell and Q9 Regenerative Medicine Translational Research Institute, the Joint Institute of Peking University Health Science Center, University of Michigan Health System, Peking-Tsinghua Center for Life Sciences, the National Science and Technology Support Project (2014BAI02B01), the CAS Key Technology Talent Program, the G. Harold and Leila Y. Mathers Charitable Foundation, and The Moxie Foundation.